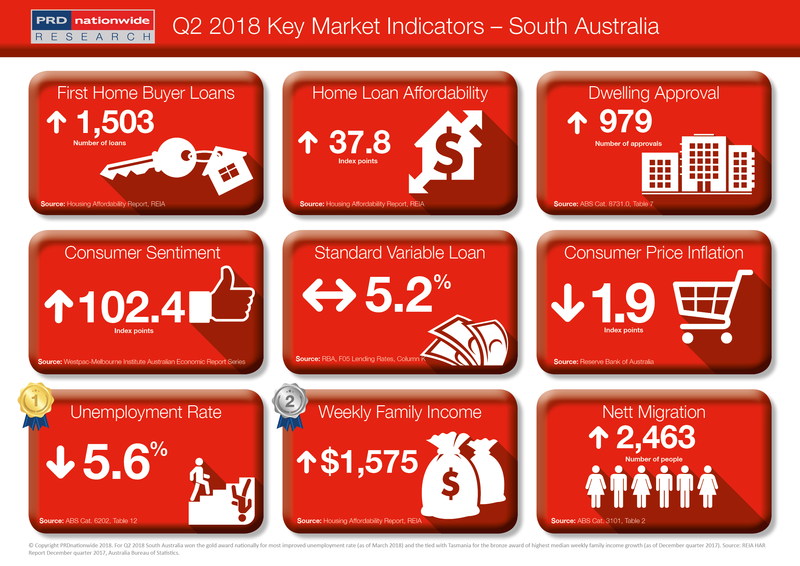 South Australia achieved the gold award nationally for most improved unemployment rate in the PRDnationwide Q2 2018 Key Market Data Indicator Awards. If you are looking for a change in career or wanting to enter the workforce, SA looks to be the best state to do so as it earned the gold award nationally for most improved unemployment rate in the PRDnationwide Q2 2018 Key Market Indicator Awards. Declining by an impressive 21.1% over the past 12 months to March 2018, SA recorded an unemployment rate of 5.6%, which is on par with the Australian average of 5.5%. This is excellent news, as more people are contributing towards a stronger economy, which will have a positive multiplier effect on the property market. Already there is an increase in the number of first home buyer loans, with the December quarter of 2017 recording 1,503 loans. This represents a 19.0% growth which is encouraging for those wanting to enter the property market. That said, property prices in SA have undeniably increased over the past 12 months reflected by a marginal 0.3% increase in the home loan affordability index. SA records 37.8 points on the home loan affordability index, which although is higher than the Australian average of 31.6 index points, does put SA behind WA (41.9 index points), TAS (38.9 index points), the NT (47.9 index points) and the ACT (51.0 index points). Furthermore, there is an imbalance in the number of dwelling approvals and interstate migration. Dwelling approvals only grew by 2.2% over the past 12 months (to March 2018), whereas nett migration grew by 53.6% over the past 12 months (to September 2017). This suggests the need for a state-wide strategy that focuses on increasing supply, before affordability becomes a concerning issue.